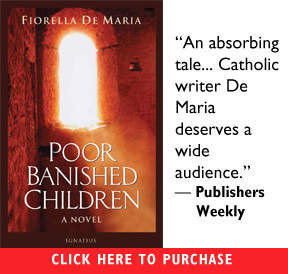 Read the first chapters of the novel Poor Banished Children by Fiorella de Maria. 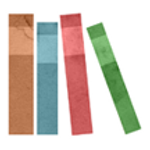 If you like what you’re reading, visit the novel’s page to learn more or order! Death is so slow in coming that I find myself fighting. If I had desired death as I yearned for it once, I would not have run onto the deck when I knew the end was truly coming; I would not cling now to splintering driftwood, praying that it will hold me. The very motion of lifting my head to take a breath is an act of defiance. I feel no pain, the chill takes away all sense, and I feel only the weariness of death as it reaches out to me. I have died so many times and been returned to the land of the living that I could almost believe I am not meant to go down with the ship—but I am cold. I am cold and weary and cannot draw breath any longer. In the gloom above my head a single star shines. Stella … Stella Maris. I am lost. Stella Maris. I call out to the Star of the ‘Sea but cannot hear my own voice ringing out across the murderous water. Perhaps this is death, then—cruel death from which I can never awaken. I cannot hold onto the driftwood any longer. My hands grow limp and numb with the cold, so that I cannot feel my own fingers as they uncurl. A group of fishermen found her body at first light. She lay on the beach—her hands still curled around the driftwood that had carried her there, her hair covering her face so that they thought at first she must surely be dead. However, when they turned her over they saw colour in her face, and they were so struck by the sight of her that they carried her into the town to see if she could be saved. “Would it be impertinent of me to ask how this woman came to your house, my lady?” asked Mr. Forbes, when she had dismissed the servant from the sickroom and they were at liberty to talk. As a physician and fellow Catholic, he had attended the family for many years and was Lady Alice’s most trusted confidant, but never had she called him on so strange an errand. ‘Some men carried her here this morning”, she said, seating herself by the window. “They said a ship had gone down in the night—they heard an explosion—and that she had been found on the beach, half-drowned. Naturally I took her in and ordered the servants to care for her, but when they tried to undress her they discovered she was horribly injured and were afraid to do her any further harm. He was cut off by the patient beginning to move; he quickly turned her onto her back again so that he could look at her face more clearly. Her eyes were open and she looked at him in undisguised terror. “Hush now, do not be afraid”, he said, but knew he was wasting his time. She clearly could not understand a word he said. Forbes let out a long sigh. Quite without knowing it, she had made the most dangerous final request she could possibly have articulated.